Unidoor-X 58-inch x 72-inch Frameless Rectangular Pivot/Hinged Clear Shower Door with Bronze Accents The DreamLine Unidoor-X is a frameless shower door, tub door or enclosure that features a luxurious modern design, complementing the architectural details, tile patterns and the composition of your bath space. Unidoor-X showcases sleek, clean lines to enhance any shower space, creating a stunning appearance. DreamLine exclusive ClearMax water repellant and stain resistant glass coating adds superior protection from stains and is nearly maintenance-free. Unidoor-X is part of DreamLine Unidoor collection, the most versatile line of shower doors and enclosures on the market. Pictured SlimLine shower base is not included. Limited Lifetime Manufacturer Warranty. (Oil Rubbed Bronze and Satin Black finishes limited to 1 (one) year warranty). IMPORTANT! All measurements should be taken only AFTER walls are finished (tile, back walls, etc. ); Professional installation recommended. Please note, drilling into the threshold is required for the proper installation of this product. 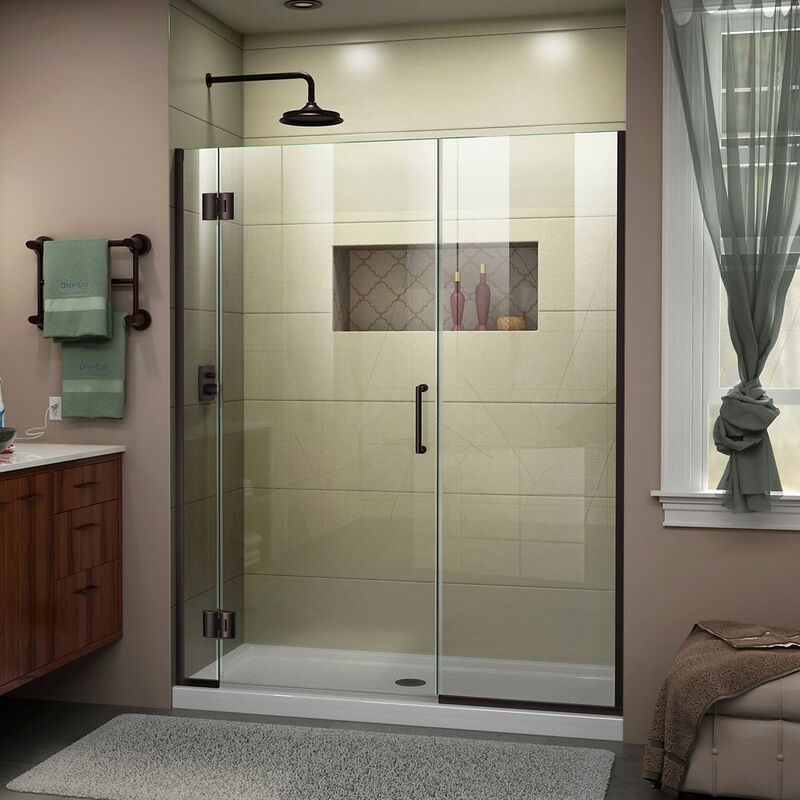 Unidoor-X 58-inch x 72-inch Frameless Rectangular Pivot/Hinged Clear Shower Door with Bronze Accents is rated 4.5 out of 5 by 2. Rated 4 out of 5 by Mari from have a problem with the door not staying up, sags... have a problem with the door not staying up, sags at the hinges. Rated 5 out of 5 by MAC from Amazing simple to install product - good old delta comes... Amazing simple to install product - good old delta comes through again!